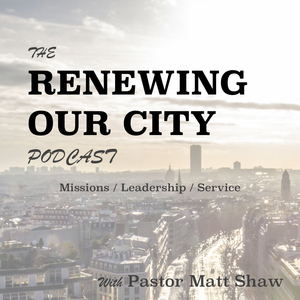 We found 4 episodes of Renewing Our City with the tag “church planting”. Mike Hammer is the Sr. Pastor at Celebration Community Church in Dillsburg Pennsylvania. It’s great to see his passion for a small community where they are making a huge impact. Guys like mike are what this podcast is all about, to take ownership in bringing the message of Jesus Christ to your community and change the world. In this episode, Matt Shaw and Jose Rodriguez discuss Jose’s background on how he became a pastor and church planter, starting house churches, using outside finances missionaries receive for the most good, how to do ministry with your family, and being a family to young men coming out of gangs. Ben Hardman with Gravity Leadership has experience at one of Americas largest church, Church planting, and coaching other christian leaders to live on the mission Jesus has called us to. Ben speaks on growing Christian Leaders, giving access to your life, discipleship, and the need for an apprentice.